Explanation: Welcome to multiwavelength astronomy! From top to bottom, these stacked panels show the largest sunspot group in a decade in visible, extreme ultraviolet, and x-ray light. All were taken on March 29, around the time the famous solar active region, catalogued as AR 9393, was at its peak size -- over 10 times the size of planet Earth. 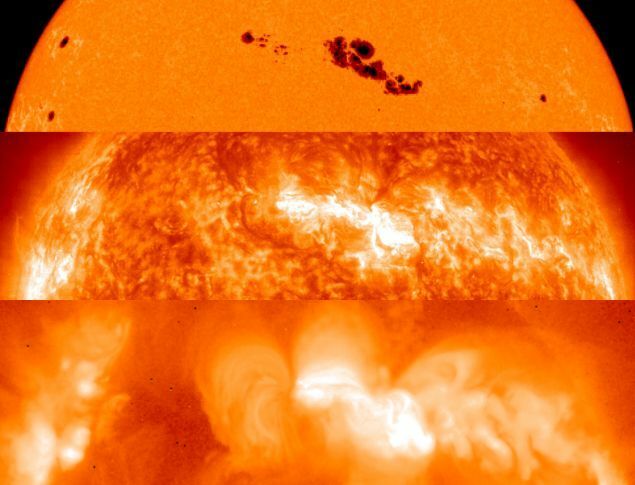 The panels illustrate how the "appearance" of the active region changes, when imaged in electromagnetic radiation (light) of progressively shorter wavelengths. In the visible light panel, dark islands of sunspots stand out against the bright solar surface, but the situation seems to be reversed in the extreme ultraviolet panel with a bright active region seen against a darker background. Finally, the x-ray panel reveals majestic loops of glowing plasma arcing far above the sunspot group. Why do pictures of the same part of the Sun look so different? Made at different wavelengths, each panel actually records a different layer in the solar atmosphere. Top to bottom, the altitude of each layer (along with temperature) increases; starting with the Sun's visible surface or photosphere (about 5 thousand kelvins), then the chromosphere / transition region (ten to a hundred thousand kelvins), and finally the solar corona (millions of kelvins).